Scheduled Date of Release: 9th of April, 2015. Its a good news for those who are awaiting the release of Manipuri film TORO and fans of the Trio (Redy, Soma & Bala). The post production of the movie are almost wrapped up and makers decided to release the movie TORO on "9th of April, 2015" at BOAT. As 9 is considered as the biggest and luckiest number in all digits, Mami Mahei Pictures and Producer fixed the grand premiere show of TORO on this day by a little delay of two weeks. 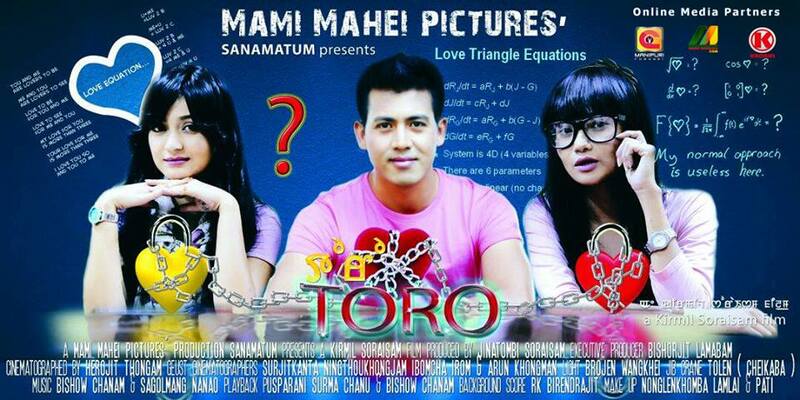 TORO is a romantic Triangle comedy Movie and features Redy Yumnam & Soma Laishram as protagonists. The dashing beauty Bala Hijam, and Pamba Elangbam will enter to their simple world and made a complete change in the story. TORO is a film of Romantic love triangle and will show you the best ever chemistry of Redy Yumnam and Bala Hijam. It is a well characterized. film in which KIMI is torn between TORO (Soma) and THOIBI (Bala) of their radically contrasting personalities. After the release of its trailer and the two songs "Lei Eigi Nungshiba" (Surma & Bishow) and "Nangna Khangbidraba Nungsiba"(Pushparani), the expectations on the movie have skyrocketed and audiences are sure that the film is going to be a visual treat for them. Many actors like Rk Hemabati, Ganashyam, Dhanamanjuri, Joy nongada, Surjit, Pakhangba, Mangal, Pamba Elangbam, Sorri Senjam, etc and many mores will show their acting talents in this movie. Protagonist: Redy, Soma & Bala, Supporting: Rk Hemabati, Ganashyam, Dhanamanjuri, Joy Nongada, Surjit, Pakhangba, Mangal, Pamba Elangbam, Sorri Senjam etc.